For over 20 years, Rocky Mountain Dance Theatre has produced the annual production of the Nutcracker in Cody, in December. This full length professional production features guest master dancers along with over 100 children and adults from Cody and the surrounding areas. RMDT is the non-for profit organization in relation to Rocky Mountain School of the Arts also in Cody, Wyoming. When is the Nutcracker audition? Do they have to belong to a dance studio? No, but if they are given a pointe role, they must enroll in ballet and pointe class twice a week at RMSA. Do they have to have dance experience? Females: Leotard, tights, pink ballet shoes. Optional: ballet skirt or ballet shorts. *IF you don’t have dance attire, wear something you can move in easily, and socks. Those auditioning will be given numbers to pin on them. 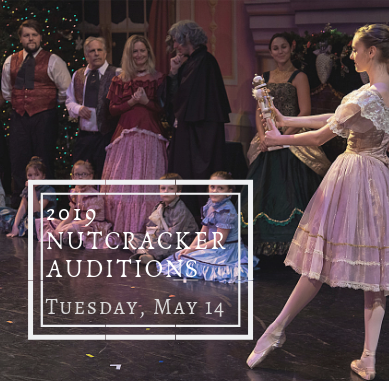 Parents will need to be present to fill out a registration and policy waiver sheet before the audition time. Auditioning days have a lot of people in the studio at one time, please keep your kids calm & quiet so everyone can hear for when their group is called into audition. Those auditioning will be asked to perform different steps or act out different roles. Parents cannot watch or be in the audition room. A casting list will be posted on the website: www.rockymountaindancetheatre.org as well as on the front door of the studio. Posting is usually done a week after the audition. If you receive a role, rehearsals will begin in September and most rehearsals will be Monday’s after school until we get closer to performance date. Exact rehearsal schedules will be sent to your email in the summer. What is the fee to participate in Nutcracker? The fee to participate is $35 for one role, $15 for each additional role. This fee covers rehearsals and costume rental/cleaning. Full fee amount is due at the time of the first rehearsal in September. This fee does not cover dance shoes, tights, leotards, etc. Nutcracker fees will be posted to your online account. If you are new to our system, a password will be sent to you through email. Other Expectations of Participating in the Nutcracker? Please be aware, as this is a professional production, attendance to all practices/rehearsals is extremely important. Participants are allowed two absences; which includes sports, sickness, or family vacations. If you will not be able to participate because of the attendance policy, Elizabeth will have to assign the roles given to your participant to someone else. If I have family/children participating; do I need to purchase tickets to attend the productions? Yes, tickets are reserved seating and participants are notified when pre-public sale tickets are available and are given a discount code with an expiration date. After the code expires, tickets are full price and ticket sales are then open to the general public.